Da Thomas Alva Edison (* 11. Feba 1847 z Milan, Ohio; † 18. Oktoba 1931 z West Orange, New Jersey) woa a amerikanischa Eafinda und Gschäftsmo. Sei Eafindunga homs Lem af da gonzn Wejd beeihflussd, beispuisweis de Glialampn, de Fuimkamera und da Phonograph. Da Edison woa oana vo de easchtn Eafinda, de wo de Grundsetz vo da Massnproduktion ogwendd hod und a professioneje, große Foaschungs- und Entwicklungobteijung afbaud hod. Ea hod on entscheidndn Beidrog ba da Elektrifiziarung vo da Stod New York und da Eihfiahrung van Elektroliacht gleisdd und so'n Grundstoa fia de Elektrifiziarung vo da gonzn industriejn Wejd glegd. Des is a Iwablick iwa de amerikanischn Patent van Edison. U.S. Patent 0.132.455 – Paper for Chemical Telegraphs etc. U.S. Patent 0.160.405 – Adjustable Electro-Magnets for Relays, etc. U.S. Patent 196.747, Stencil-Pens. Later adapted to be a Tattoo machine. Patent drawing for Edison's phonograph, 18 May 1880. U.S. Patent 0.200.521 – Phonograph or Speaking Machines : The first phonograph, a device for recording and replaying sound. 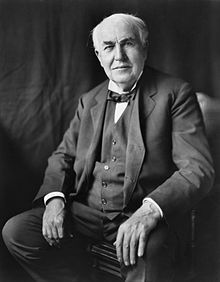 Edison demonstrated the device for the first time on November 29, 1878. The device recorded on a phonograph cylinder using up-down (vertical) motion of the stylus. Edison's patent specified that the audio recording was embossed. U.S. Patent 0.222.881 – Magneto-Electric Machines : Edison main dynamo. The device's nickname was the "long-legged Mary-Ann". This device has large bipolar magnets and is highly inefficient. U.S. Patent 0.223.898 – Electric Lamp : Edison's incandescent light bulb invention. The original spiral carbon-filament is shown and repeatedly referred to. First practical commercially viable electric lamp. This device replaced the flame lamp, gas lamp, kerosene-oil lamp, and wax candle. U.S. Patent 0.248.436 – Depositing Cell for Plating the Connections of Electric Lamps, & c.
U.S. Patent 0.373.584 – Dynamo-Electric Machine : Includes an extra coil and utilizes a field of force. U.S. Patent 0.589.168, Kinetographic Camera of Edison Company. U.S. Patent 0.865.367, Edison's fluorescent lamp worked using tungsten of calcium and strontium. U.S. Patent 0.759.356 – Method of Burning Portland-Cement Clinker, &c.
U.S. Patent 0.759.357 – Apparatus for Burning Portland-Cement Clinker &c.
U.S. Patent 0.898.633 – Filling Apparatus for Storage-Battery Jars & c.
US1255517. Starting and current supplying system for automobiles. 1. Auflage 1910, Band 1, Band 2. 2. Auflage 1929, (Online-Ausgabe bei gutenberg.org). George J. Hill: Edison’s Environment: Invention and Pollution in the Career of Thomas Edison. New Jersey Heritage Press, 2007, ISBN 0979507308. ↑ Walsh, Bryan. The Electrifying Edison , Time.com, July 15, 2009. Obgruafa am December 31, 2013. De Seitn is zletzt am 21. August 2018 um 02:33 gändert worn.